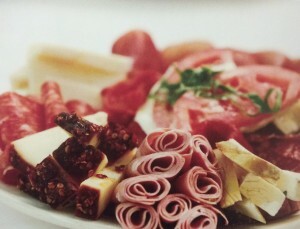 Prepare a large platter with listed ingredients. For presentation, David rolls each slice of prosciutto, mortadella, and sopressata and fans them around the edge of the plate, alternating with sections of the sausages, provolone, Parmigiano-Reggiano, and pecorino. Serve the mozzarella alongside the slices of tomato. Salt and pepper the platter, then drizzle with the extra-virgin olive oil. Garnish with basil leaves.